Engine diagnosis warning lamp lights up in instrument cluster, fault code u145400: "implausible data were received from the ethanol sensor"
Mercedes-benz: the malfunction light is on with multiple possible trouble codes stored. there could be a problem with the camshaft and/or scoring of a piston. Mercedes (xentry): engine makes noise, ticking/crackling at idle speeds up to approx. 1500 rpm. run in effect of 1st crankshaft main bearing. models 211, 219, 164, 251, 203, 204, 209, 221, 461 and 463. no model years listed. Mercedes-benz: there is a transmission trouble code stored. it is a diagnostic problem with the wet start-up clutch. 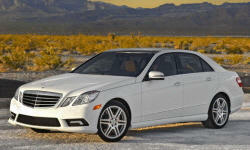 Mercedes-benz: the vehicle jolts during start-offs, steady driving, or acceleration. the control valve temporary jams. updated 12/28/11. Mercedes-benz: the auto-transmission switches to limp home mode or has no power. there are multiple possible fault codes. a piston may be damaged. Comand: no sound, sdars message in central display "device unavailable"
Mercedes-benz: software update for heater lines. Mercedes: on some affected vehicles, the trunk lid may touch bumper during closing. Mercedes-benz: the rear door cannot be opened from the outside in cold temperatures. the window guide rail of the door freezes. Mercedes-benz: installation information of bolted wheel connections. all models.